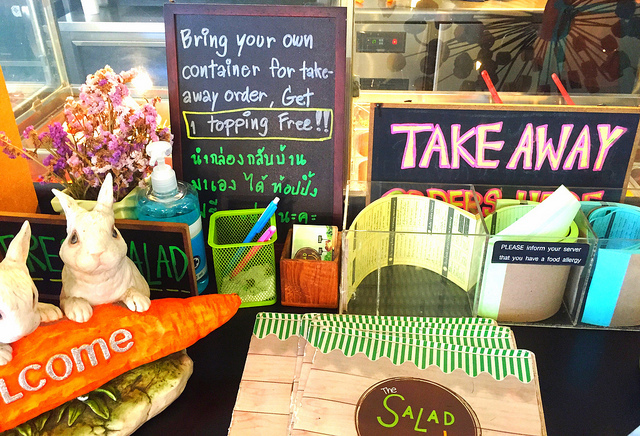 Located in the University area of Chiang Mai, Salad Concept offers large and inexpensive salads with an array of toppings. The basic salad (less than $2.50) is a bed of greens (mostly lettuce) and comes with 5 free toppings - you pay extra for each additional one - and a choice of one of their homemade dressings. Salads are large and easily count as lunch. They also get bonus points for offering discounts to customers who bring their own takeout containers. The homemade pumpkin salad dressing is delicious.